Why does my dog eat feces!? Summer cleaning means that there are things being moved around and reorganized. It is easy for our dogs to get into the wrong items. Pet Poison Prevention should always be on our minds. Learn about the common items that can poison your dog in our Pet Poison Prevention Chart. This chart contains a list of common household items as well as plants that may be harmful to our dogs. And while foxtails may not be toxic to your dog, they can seriously injury your dog. Learn about how to prevent a fatal situation for your dog. Warm weather is right around the corner. What you don't know could hurt your dog. Learn how to prepare for the heat with our "Warm Weather Tips". Picking the right puppy for your situation is easy when you know how to do it. A simple Puppy Temperament Test can give you the insight you need to find a dog that will best fit your families situation. Did you come home to find your personal items all chewed up? Find out why canine chewing occurs and how you can prevent your property from being destroyed. Barking Problems? Learn how to get control of this common dog issue. Are you having Housebreaking Issues? Learn about how to deal with this frustrating problem. Crate training can help with a variety of common house problems. Preventing dog bites toward children is every dog owners responsibility. Have you noticed that your dog aggression has been getting worse? Your dog might be learning this behavior by accident.When all else fails it's time to start an anti-bite training dog behavior modification program. You just planted your spring garden only to come home and find that your dog has done some remodeling your beautiful landscaping project. Learn about why your dog is digging and how to prevent it from happening again. Dogs love raiding the trash can, we hate the mess. What can you do? Or have you ever returned only to find your food missing from the table? Stealing is a dog behavior that should not be ignored. We all love the happy greeting we get from our dogs when we get home, except when their jumping soils our nice clothes or frightens our guests. Whenever your dog starts to regress from their training it's always a good idea to do an Puppy Training | Dog Training obedience review. Dog Communication comes in many different ways. What is your dog trying to tell you? Dog to Human Communication can be a challenge unless you know what to look for. Take our Dog Personality Quiz to learn about your dogs personality. Dog Calming signals is one way your dog may be sending you a message. Our Canine Body Language Chart can give you a clue to what your dog is trying to communicate as well. This is your complete resource for your dogs training information. Learn about puppy training, dog obedience training, dog behavior modification, dog care and canine problem solving, clicker training, dog agility training, grooming and dog care, canine communication and dog training and safety tips. Are you looking to work with a professional dog trainer in a live class environment? In an ongoing effort to provide you with the best information about our live dog training services, we've published our complete Puppy Training, Dog Training Course Catalog on-line. Where are the Group Dog Training Classes located? And what is the Group Dog Training Class Schedule. We offer a complete range of dog training services ranging from behavior modification, puppy training through advanced dog obedience, agility and K-9 services as well as different levels of tracking and area search to train your detection or Search and Rescue dog. These dog training classes are offered for everyone from children through adults. 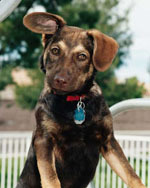 You can work in small Group Dog Training Classes or in Private In-Home Lessons. You can find detailed information here: Puppy Training, Dog Training Course Catalog. Wouldn't it be nice if you can send your dog to Dog Training Boarding School and pick him up responding to a higher level of obedience? Yes, we offer a Board and Train program for all levels of obedience from Basic Dog Obedience through Advanced Dog Obedience. Our goal in puppy training is off-leash obedience without the use of food in our formal dog training program. At DogSkool we're helping you with your dog training. In our effort to provide you with everything you need for training your dog, resolve your dog problem behaviors and understand dog training in the comfort of your own home we have expanded our on-line dog training resource. Our Dog Handler Center section briefs you on the scientific principles surrounding dog training and dog learning. How your dog learns and stores this learned information in their brain is all covered in this in depth study of dog training theory. This is the listing of all of our live dog training classes. They include our Group Dog Training Classes, our Private In-Home Dog Training Classes and our Board and Train Dog Training programs. This is our Live Group Dog Training Schedule of when our group classes meet and where they meet. In the San Jose, CA area there are 5 locations offering group dog training from puppy training all the way up to advanced dog obedience. All group classes meet on Saturdays and are on-going which means you can start as early as this week. See the FAQ's to see how this works. Our Dog Handler Center aka Student Center hosts our Dog Training Theory Manual and our FREE eMail Dog Training Class lessons. Here you can learn all the theory behind modern dog training. Also how dogs learn and remember the information we are teaching them. Very important information for the understanding of what we are doing to train our dogs. This is your complete resource for your dog training program. You can learn all the skills and information needed to pick the right puppy for your family, raise your new puppy to become a happy member of your family, solve most any problem that your new dog or puppy might have and our ever growing list of obedience commands to teach your dog or puppy how to behave in our complex world. You can also learn about clicker training, dog agility training and get reviews of the best dog training books and dog training videos on nearly every dog activity. These dog training sections gives you the solutions to nearly everything your need to raise a happy dog from puppy raising and puppy training to solving problems like dog biting, chewing, digging, jumping, stealing, barking, and housebreaking. We also have covered all your obedience commands including; heel, sit, down, stand, sit-stay, down-stay, stand-stay, come, finish, sit out of motion, down out of motion, stand out of motion, down on a recall, down out of play, right turn, right turn about, left turn, left turn about, turn against your dog, in place turns, send out, drop it, speak, quiet and more! This is your obedience dog training program presented in a well planned step by step 14 week dog training course. This course has been offered online since 1997 and has had 1000's of students from all over the world. We are pleased to offer this service to all of you, giving you a NO cost structured dog training class. Keeping you posted on the happenings in the world of DogSkool. You are online and may need a break. Our arcade center provides some fun games to play, as well as the old standard games. Show us your dog and we'll show you ours. Press and News releases as well as brochures and information in a quick easy access format. We share great sites we use and our friends that use our site. What dog training center would be complete without a Pet Store. Here we offer the best products that you will need in the raising and training of your dog. Do You Have Any Other Questions On Your Dogs Training or Behavior Modification? Contact Us by either calling us at +1 (408) 733-2829 or send us a message using our handy contact form. Have We Missed Anything About Your Dogs Behavior Modification? Let us know and we will try to get it to you and post it to our growing dog training resource. When you like what you do, you have a good job; but when everything you do is the focus of every waking moment and you love it, then you have a great job. So put us to the test, if you find anything difficult to understand, let us know so we can clarify it and make it easier for you and everyone else. Questions, comments or just an interesting story about your dog? Write us, we want to know.